The city of Pripyat in the Ukraine was founded in 1970 to house the families of workers at the Chernobyl Nuclear Power Plant. It was abandoned in 1986 following the Chernobyl disaster, when the 30-kilometer area around the nuclear power plant was evacuated to restrict access to hazardous areas, reduce the spread of radiological contamination and conduct radiological and ecological monitoring activities. This area was designated as the Chernobyl Nuclear Power Plant Zone of Alienation. It is now known as the Chernobyl Exclusion Zone or just The Zone. 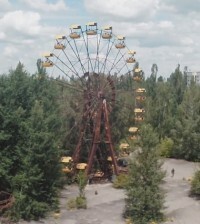 The ferris wheel in Pripyat’s abandoned amusement park has become iconic, often seen in photographs of the city, video games (such as Call of Duty 4: Modern Warfare and the S.T.A.L.K.E.R. series) and visible from aerial-imaging websites such as Google Maps. 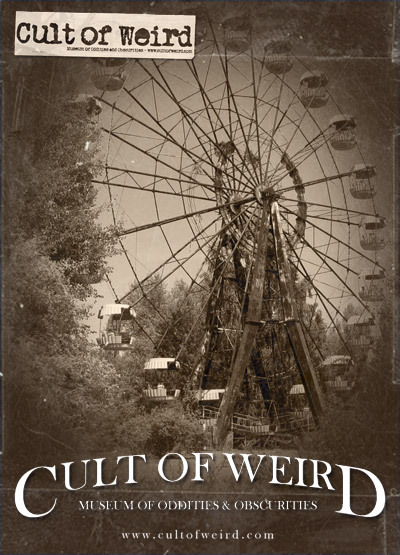 Pripyat has become the setting of many books, films and documentaries over the years, as well.